Microarray substrate slides (25 x 76 mm) containing a 150 micron thick layer of nylon on atomically smooth glass substrates with corner chamfer for unambiguous side orientation. A time-tested nylon membrane surface for a wide variety of DNA and protein microarray applications provides compact printed spots, intense signals, and low background. 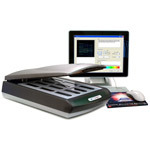 Use in conjunction with NanoPrint and SpotBot 2 Microarrayers, InnoScan and SpotLight Fluorescent Scanners and SpotWare Colorimetric Scanners. SuperNylon is manufactured in class 1 cleanrooms and packaged in heat sealed anti-static shipping pouches, 25 substrate slides per box.